This short story was an entertaining and enjoyable read. I thought it could have a made a fantastic full-length book if the concept had been developed further. Creatures that are hybrid human-locust; I mean, wow scary! After losing their parents to a car accident, Kevin and Bobby Dalton move to their grandparents' small Texas farm. Their grandfather is a strict, religious man determined to mold them into farmers. While running a combine harvester in the cornfield, Kevin is attacked by a small swarm of locusts. 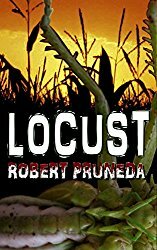 He tries to warn his grandfather about the destructive pests, but locusts in the cornfield aren't what the Dalton family should be worried about. Something far more menacing is about to infiltrate their home.